How does a customer know that what they just paid for is actually what they received? The system that provides this public trust is a carefully regulated process. 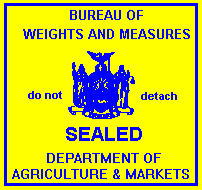 Article 16 of the Agriculture and Markets Law regulates how “commodities” are packaged and sold in New York State. The complete Article can be found at http://www.agriculture.ny.gov/WM/LawArticle16.pdf. If selling food items pre-packaged, these need to be accurately marked, with (a) the net weight, standard measure or numerical count, (b) the selling price per pound or unit of standard measure and (c) the total selling price. If selling bulk items by weight an approved scale must be used. The vendor is responsible for purchasing an approved device AND having it certified by a local Weights and Measures official. Many scales available at common retail outlets are not appropriate for use; visit http://www.agriculture.ny.gov/WM/725.pdf for a list of approved commercial devices. At this time there is no fee in many counties to have equipment certified, but there is a fine for not using approved scales and for every mis-weighed unit available for sale. If you sell plants for landscape use including bedding plants, perennials, shrubs and trees grown in a nursery or greenhouse, you will need to be licensed as a Retail or Wholesale Nursery, or Plant Grower by the NYS Dept. of Agriculture & Markets. If you sell cut flowers or houseplants the license is not required. As a plant seller your greenhouse/nursery crops are subject to inspection to protect the customer from potentially diseased or insect infested plant materials. Regional Inspectors will visit your production facility to inspect plants before you begin sales and thereafter annually. There is a fee for the license. No licenses are required. Produce must be sold free of debris and in clean containers. Bulk displays are not subject to grading, labeling or packaging. Follow Good Agricultural Practices In order to protect food from microbial contamination, producers should follow good agricultural practices. To prevent contamination of produce and water supplies, follow good sanitation practices, avoid introducing raw manure into fields, test irrigation and wash water for bacteria, change wash water regularly. Test water for bacteria annually and maintain good records. Here is a brief summary of some regulations. Poultry exemption Farm-raised poultry is exempt from NYS and USDA inspection if the farmer raises and slaughters not more than 250 turkeys OR not more than 1000 of all other poultry (chickens, ducks, geese, etc.) per year. Four birds of other species are equivalent to one turkey. If you raise more than this per year the birds must be processed in a licensed facility and stamped if for commercial/retail sale. Other Meats (beef, lamb, goat, pork) These farm-raised meats must be processed in a USDA licensed facility if intended for commercial/retail sale. These meats can be processed in NYS custom exempt slaughter plants only if they will be consumed by the animal’s owner, his or her family, employees, or non-paying guests. Such meat must be stamped “Not for resale.” Further processing of meat such as making sausage, etc. must be done in a USDA certified facility or NYS certified processing facility/kitchen holding an Article 20-C license. See Fact Sheet #28 for more info on 20-C licensing. Exotic Animals Bison, deer, rabbits, and ratites must be slaughtered in a NYS Custom Exempt Plant if the meat will be sold. Inspection is not necessary for retail sales (to end user). For questions about meat slaughter and sales, contact NYS Ag & Markets at 518-457-4492. Whole fish Without any special permits, you may sell a fresh whole fish at your farm to a private customer. You may bring completely chilled fresh whole fish to a farmer’s market and sell to a private customer. Keep fresh whole fish at 32°F with crushed ice or in a refrigerated unit. Eviscerated fish Entire gut contents are removed and the fish is thoroughly rinsed with fresh water that is 38°F or lower (water is of public source or from a tested well.) Chill the fish to 32°F immediately. At this point, the fish can be frozen and kept in a frozen state for sale. Frozen eviscerated fish may be sold at the farm or at a farmer’s market; fresh and properly chilled eviscerated fish may be sold at a farmer’s market or at the farm. Fillets Filleting fish or any similar processing requires an Article 20C Food Processing License at your farm or a facility off-farm that carries a current 20C Food Processing License. You may transport your fish to a 20C facility and use it temporarily (usually for a rental fee). Such fish may be sold to individuals, stores, or restaurants if in a frozen state. Fresh fillet sales requires an Article 28 Retail Food Store license (where food and food products are offered to the consumer and intended for off-premises consumption and conducts no food processing). As of June October 2016, an Article 20C license fee is $400.00 and an Article 28 license fee is $250.00. Egg cartons must be marked with grade and size (though producers selling eggs of their own production directly to consumers are exempt from this requirement). Eggs may be sold in bulk displays but grade and size must be indicated. Additionally eggs should be washed and candled, cartons must include the name and address of producer and the date packed, and eggs must be held at 45 degrees F or lower. For a fact sheet on egg sales consult: http://www.agriculture.ny.gov/FS/general/farmprods.html. These products are exempt from licensing if you do not add ingredients or repack. Production facilities must be clean and sanitary. If you make specialty flavored honey or maple products, you must have an Article 20-C license. Maple syrup is subject to grade identification. For more information on the sale of Maple Syrup request Circular 947 from the NYS Dept. of Agriculture & Markets or check this website for a copy: http://www.agriculture.ny.gov/FS/general/farmprods.html. Cornell Viticulture & Enology Program – Geneva http://www.grapesandwine. Until the end of 2018, at least 20% of the hops and 20% of all other ingredients must be grown in New York State. From January 1, 2019 to December 31, 2023, no less than 60% of the hops and 60% of all other ingredients must be grown in New York State. From January 1, 2024, no less than 90% of the hops and 90% of all other ingredients must be grown in New York State. Requires an Article 20-C license for processing. Good manufacturing practices must be followed. Apples must be firm and washed. Pasteurization or Ultra Violet treatment is required. HACCP (Hazard Analysis Critical Control Point) plans are required for cider and juice processing facilities if selling wholesale. Milk can not be transported from a farm to a processing facility without a license and dairy products processed in your home kitchen or a commercial kitchen can not be sold to the general public. You must have and maintain a certified milk processing plant on your farm if you plan to sell dairy products to the public. Once a plan has been developed, you may also want to contact the Cornell Department of Food Science Cooperative Extension (http://foodscience.cornell.edu/cals/foodsci/extension/index.cfm) or the Dairy Plant at SUNY Morrisville at 315-684-6106. They offer instructional programming schools/workshops for dairy processors and have staff that may be able to help review your plans and offer advice. Due to the potential liabilities of selling unpasteurized milk to the public, it is highly discouraged by the State and the Cornell University Department of Food Science. However it can be legal. Your farm may sell raw fluid milk if you apply for permits and meet several additional tests and requirements that other milk processing facilities do not have to meet. Hard cheese made from raw milk may be sold to the public if labeled raw milk cheese and aged at least 60 days. A permit is still required.